iSophie: Grey Chicken, a conclusion of sorts. Grey Chicken, a conclusion of sorts. So some of you read my recent post about Grey Chicken being a terrible mother, I thought it would be polite to follow up on her how things turned out. 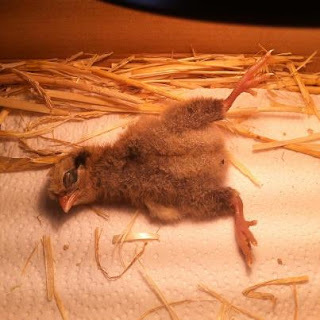 The day after my post, she had one chick hatch, it unfortunately didn't make it through the night, possibly there was something wrong with it, or possibly she suffocated it accidentally. That day, she had another 2 hatch, and had moved herself and her babies away from her pile of eggs... that were still trying to hatch. So knowing her incompetence as a mother I had been keeping a close eye on the proceedings, and saved the remaining eggs. One egg, that had already pipped (started to crack the shell), didn't make it. The others went into the incubator just to give them a fighting chance. Later that day another one of her babies was dead, again from unknown causes. She still had one chick though! She was finally a mother again. Unfortunately.. being the stellar mother that she is, she left the safety of the shed on the very first day, before I had a chance to move her that night to the safety of the enclosed nursery area. I have to move them at night because they have very poor eyesight and cannot see you coming. If I tried to get her in the daytime, she would have scattered, so would the chick and probably lose it completely in the clutter of the shed. They -usually- stay put with their babies for a day or two before leading them out into the big scary Goshawk world. At dusk there was a whole lot of chicken bock screaming going on. The rooster was going off his head, sounding the alarm, whilst hiding in the shed. I ran to the rescue, but it was too late. The Goshawk was no where to be seen, but neither was the chick. Grey Chicken was beside herself with worry, bocking and scratchy at the ground, trying to encourage the little chick to come back. She has since gone into a chicken depression, sitting on a new nest, the nest is empty, she just doesn't know what to do. But there is a silver lining! One of the eggs in the incubator hatched! Spotty, formally know as Stripey, Pecky, Chirpy and Danny, is doing really well! No, not dead, although this was the initial consensus. With legs that are way too big for a tiny chicken, Spotty has trouble standing up. Splayed legs are much more comfortable. Spotty is a much loved member of the family at the moment, because it's cute and little. Spotty is annoying at night time though, cheeping like the house is on fire, so has been moved from the bedroom to the bathroom at night. As far as Grey Chicken is concerned, time will tell if she decides to try again. Part of me hopes she doesn't. Also, an update on Pichu's Ulstrasound. No scarring to be seen in either kidneys! We won't see the Paed for another month, but the sonographer was very positive there was nothing unusual to be seen.